I find it interesting how social values change over time. It appears social norms change quickly, almost as if the common collective “social consciousness” seemingly bands together to decide that a social practice is no longer acceptable. This type of transformation is now happening with the harmful impact of commuting to a job – remote working is now paving the path to better options. While these types of social changes might appear to change suddenly, in fact, these changes slowly simmer until bursting into the mainstream. We saw this occur in 2018 with society’s view on sexual harassment in the entertainment and other fields (ex: #TimesUp and #MeToo). No longer is it acceptable to simply look the other way, and consider it a part of getting ahead in show business. The word commuter appears to originate from a marketing campaign set up during the early days of rail travel in the United States. In the 1840s, the railways were eager to attract new customers living in the suburbs of New York, Philadelphia, Boston and Chicago, so they offered a reduced or “commuted” fare into the city. Later, the term variations "commute" and "commuter" followed. Commuted tickets would usually allow the traveler to repeat the same journey as often as they liked during the period when the ticket was valid. Fast forward 150 years later, and the concept of life without commuting seems impossible. As population growth continues to shift either to or from Central Business Districts, the suburbs or further rural areas, it seemed like a constant that workers had to spend time commuting to work. So institutionalized is this social norm, surveys are now done to measure average commuting times, most recently as of October 2017 when Business Insider published their results. 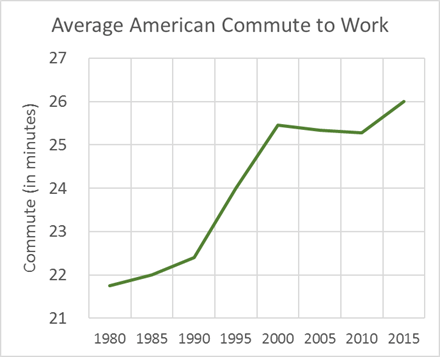 According to the article, most working Americans commute about 26 minutes each way to and from work. New York, NY holds the top honor of having nearly an average of 40 minutes spent commuting each way, every day. 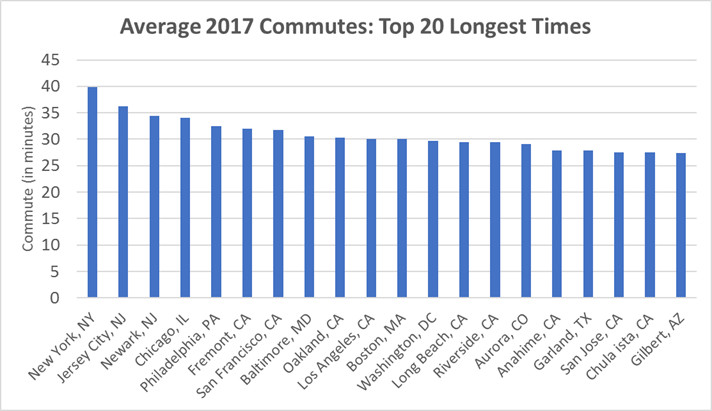 Interestingly, Oakland, Los Angeles and Boston all average about a 30-minute commute – some of these cities clearly benefiting from better public transportation systems than others. The next question you might ask is how are commutes changing? Are they getting longer or shorter? Unfortunately, they are getting longer, as illustrated in the below chart, based on figures obtained from the US Census Bureau and an article published by The Washington Post. What is further concerning is this time is essentially being wasted traveling to and from work. As pointed out in The Washington Post article, according to the Census, there was about 139 million workers commuting in 2014. At an average of 26 minutes each way to work, five days a week, 50 weeks a year, that works out to something like a total of 1.8 trillion minutes Americans spent commuting in 2014. Or, if you prefer, call it 29.6 billion hours, 1.2 billion days, or a collective 3.4 million years. The article then suggested that in that amount of time, we could have built the Great Pyramid of Giza 26 times in just one year. Wow. The future of commuting looks even worse. Averages taken across a large population base tend to hide anomalies and outliers, which are increasingly becoming more prevalent. Your Blood Sugar Rises, based on a report written by researchers from the University School of Medicine in Saint Louis and the Cooper Institute in Dallas and published in The American Journal of Preventive Medicine. As I suggested at the start of this article, sometimes a new social norm seems to come out of “nowhere” such that a new cultural standard now seems normal, like it how we had always done something. Years may pass before “suddenly” a change occurs. We are in the middle of one such change today, with regards to remote working. Increasing commute times coupled with greater awareness of health issues closely tied to being stationary for an hour at a time or more is helping to fuel a desire for change. As one example we are now at a new level of frustration, new hashtag topics are arising, the latest being #MiserableCommutes, which has a few scary stories. Look to see stories like these to become more prevalent in the future. At the same, new technologies and an increasingly global business community are giving greater “permission” to consider remote working. This is a “win-win” situation whereby employees get up to three hours back into their lives (those mega-commuters) and, at the same time, get to experience greater health benefits for no additional cost.